Everyone in L&D is obsessed with innovation and leveraging new approaches to learning to get better results. In July’s Webinar we teamed up with Comcast’s Eric VanDerSluis to give you some ideas on how to get started reinventing learning content for the next-generation learners. There is a lot of research out there on putting learners first. When you boil it down, it points to these three important changes going on in people’s learning habits. The most important shift is from L&D-driven, instructor-led training to self-directed development. Degreed’s own research (which we’ve talked about before) says that the typical worker spends 4x to 5x more time learning on their own than from the training their employers provide. What those people say works best are social learning (both from their teams and their networks), search and reading. 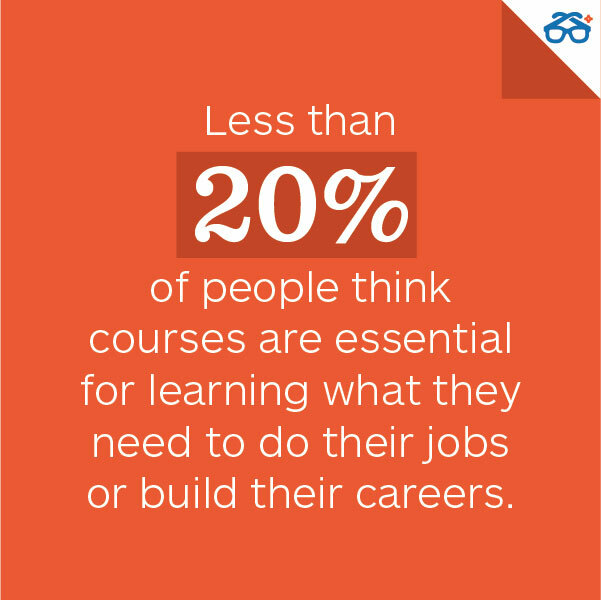 Less than 20% of them think courses are essential for learning what they need to do their jobs or build their careers. That goes for courses they find on their own as well as the ones L&D teams build and buy for them (check out Jane Hart’s research here). When learners do choose their own learning, another big shift happens: They go from uniform, one-size-fits-all solutions (like LMSs, classes and courses) to a more fragmented, diverse mix. People may end up taking fewer classes and courses. But they replace or augment them with all those other things — like projects, search, articles, videos and conversations with other people. Think about your own habits. You probably learn a little bit every day just from reading and working through problems with your colleagues. Occasionally, you go to an event (like this one) or watch a video. Every once in a while, you take a class or do a course online. L&D organizations have to do more than just build, buy and deliver courses. You also need to invest in the content and systems and capabilities to leverage that whole ecosystem. The reason you need to invest your L&D resources differently now is that learning is not an occasional event anymore. People are still learning, they’re just doing it differently. More than 70%, for example, told us they have learned something for their job from an article, a video or some other informal resource — like Google, Twitter, Quora or Flipboard — in the last 24 hours. People are increasingly empowered by apps like those to learn whatever they need whenever and wherever they want. As a result, the amount of stuff that people read has actually tripled since the 1980s. You cannot fight that. And more enlightened, forward thinking employers aren’t trying to anymore. Instead, they are beginning to reinvent how they design and deliver learning experiences to empower and channel these new habits. You should, too. The big takeaway here is simple: Workplace learning needs to adapt. And sooner would be better. Because even though learners have already moved on, 70% of L&D is still instructor-led. Most people in L&D seem to be understanding the need to adapt. The consultants and analysts and pundits do, and so does the industry media; CLO just published an article called “Learning Needs a Revolution”. Everyone is finally talking about how L&D needs to innovate. That’s good. The trouble is, not enough organizations are actually doing it for real. Most people equate innovation with technology. Learning professionals have more technology at their disposal now than ever before. Pair that tech with the dozens of new kinds of solutions available for creating, curating, delivering and tracking all kinds of learning, and that’s a stacked toolkit. It’s exciting to see so many people and organizations experimenting with, and adopting, these new tools. There’s some shiny new toy every year, though. 2015 is the year of micro-learning and gamification. 2014 was MOOCs and big data analytics. Before that, it was social learning and mobile. Next year, it’ll probably be wearables and xAPI. Unfortunately, few of these new tools seem to make it past that experimental phase to become a core part of L&D. Mobile is a prime example. Even though 64% of the workforce uses smartphones now, barely a third of employers have any mobile learning program yet, only 19% of LMS shoppers say mobile is a primary consideration and only a tiny fraction of content is accessible on mobile devices. That’s because technology and content are just tools. They don’t solve problems by themselves. That takes people. Yes, new technology and content are essential to making learning work better, faster and cheaper. But they are useless without new ways of learning require new ways of thinking, working and managing L&D, too. 1. Learning leaders need to manage innovation differently. Figuring out how to get the most out of new methods calls for new attitudes and approaches: Embracing diversity over efficiency, moving faster, making smaller bets, and accepting failure. 2. To spread those new approaches, you’ll probably need some new operating practices, too. Recruit for new kinds of skills. Try new team structures. Build more flexible, agile processes. Adjust your metrics and incentives. 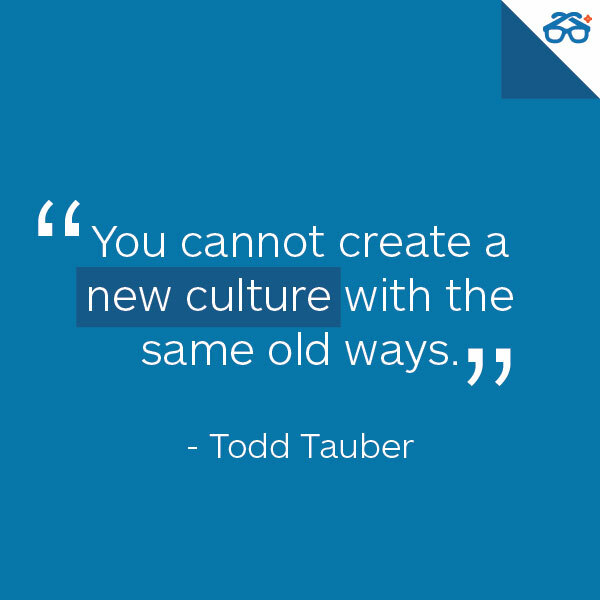 Remember: You cannot create a new culture with the same old ways. 3. L&D teams will also need to build some new capabilities. Explore new tools and technologies. Start experimenting with new methods. Figure out how to segment audiences and solutions. Learn to crowdsource and curate content. Do what learning people do best: Learn! L&D professionals have more tools in their toolkits now than ever before, but new technology and content are only part of the solution.If you want different results, you have to do something different. 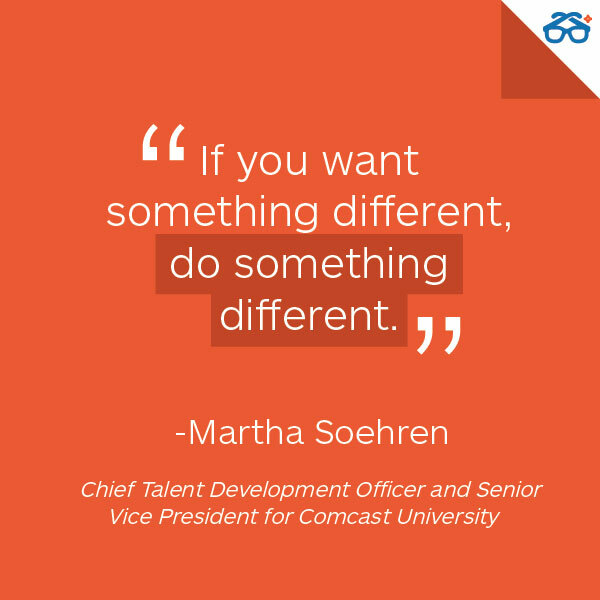 Comcast’s Chief Learning Officer, Martha Soehren, put that very elegantly. For the full recording of July’s webinar and Eric’s story of how Comcast reinvented learning click here. For more on how Degreed can help you reinvent learning content to check us out here.